The C3530n MFP from OKI Printing Solutions is one of the smallest and fastest MFPs in its class. Its an ideal solution for individuals and small workgroups who require a fast, reliable and affordable MFP that delivers high-quality color, ease of use and full multifunctionality. 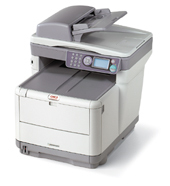 Key features of the C3530n MFP include: print speeds of up to 16 ppm in color, 20 ppm in black & white; a convenient USB front port for scan-to-memory stick; 10/100 Base-TX network and USB 2.0 high-speed connectivity; analog fax"walk-up or via host PC.